The used Hyundai Genesis is a luxury sedan that offers a silky smooth performance, refined comfort, and modern tech features. It's the perfect pick for anyone who craves the finer things. On the road, you'll enjoy a calm, quiet ride. Inside, there's more than enough room for everyone. High-end features add to the cabin's upscale style. Check out our used Hyundai Genesis buying guide to learn more about how these models have evolved over the years. If you're shopping for a used Hyundai Genesis, the second-generation models offer major appeal. Inside, the Genesis is stylish and luxurious, thanks to its high-quality materials and an abundance of soft-touch surfaces. It's an excellent option for commuters and weekend road warriors alike. You'll find an abundance of passenger space, no matter where you choose to sit. Leather seating is exactly what you need on your way home from a long day at work. The heated front seats offer cozy comfort during winter weather. The trunk provides ample space for your golf clubs, tennis gear, and weekend bags. The Hyundai Genesis cabin is also stocked with important tech features that keep you connected on the go. Wireless Bluetooth connectivity gives you access to your smartphone for hands-free calls and music streaming. When it comes to safety, you can count on the Genesis. Use the rearview camera to enhance visibility as you back out of narrow lanes or cramped parking spaces. The navigation system means you can get wherever you need to go - and in plenty of time. Shoppers can choose between two well-equipped Hyundai Genesis trims, the 3.8 and 5.0 R-Spec. Each offers its own unique engine - both of which are known for their smooth, powerful performance. The 3.8-liter V6 engine is rated for 333 horsepower and 291 pound-feet of torque, getting you up to speed in no time at all. The 5.0-liter V8 is an excellent choice for driving enthusiasts. It delivers 429 horses and 376 pound-feet of torque to maximize performance. Both engines get an eight-speed automatic transmission that's tuned for premium ride comfort. The manual shift control feature lets you downshift at will, making it easy to blend into highway traffic or pass slower vehicles. When the Hyundai Genesis first appeared for the 2009 model year, it impressed with its spacious digs and refined cabin materials. It also produced a smooth ride, thanks to a range of V8 engines. Tech features, like adaptive cruise control and an electronic parking brake, further enhanced performance. Touchscreen navigation helped drivers stay on the right path. Used buyers will notice that a few changes took place throughout this generation. 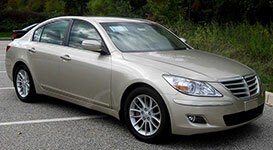 In 2011, the Hyundai retooled the Genesis powertrain so that it generated 375 horsepower and 385 pound-feet of torque. In 2012, the eight-speed transmission debuted, offering increased fuel economy and impressive response time.